Unfortunately we didn’t get up to a whole lot during our time in Saigon. It was hot and one of our tours wasn’t booked properly. Oh well! It was something of a shock to be woken up by one of the overnight train conductors, yelling loudly in Vietnamese and banging his hand on my bunk bed. Once again we had been duped by the timetable, but this time it was all on us. For some reason we had read the time 5:00 and thought 5PM – when the rest of the timetable was in 24hr time, so it was clearly 5AM. Although a bit dazed at being woken up so early, I was certainly very happy to have arrived at our destination a full 12 hours earlier than expected. We got to the hotel, but as we were very early we figured we would wait until they were properly open before going in (they shut their main gate overnight). However some random Vietnamese guy saw us standing outside with all our bags and “helpfully” pointed out that there was a bell by the gate, which he then pushed. There was no point trying to convey that we had seen the bell and had chosen not to push it. At any rate it woke up one of the hotel workers and he ushered us in and got the owner. The hotel I’d chosen had received some good reviews due to the lady who owned it being very helpful to foreign tourists, and indeed we were very grateful for that straight off the bat as she was very welcoming, even at such an early hour. She said we could leave our bags there or just hang out at the restaurant until check-in time, or we could pay slightly more for a better room and check-in early, which we did. She also chatted with us for a while and we were surprised to find her quite well traveled – a first for us when conversing with native Vietnamese. She gave us some warnings about the pickpockets in Saigon, and some suggestions of what to do during our stay. After a short nap to catch up on sleep, we headed out to see the city. Although it was witheringly hot we covered a bit of ground, starting at the Saigon river and working our way back through the city past a few highlights, such as the Opera House and Dong Khoi markets. The city is extremely Westernised. It almost feels like the Surfer’s Paradise of Vietnam. Lots of glitzy hotels and big malls. Our main stop was at the war museum. I didn’t take any footage because I felt it would be inappropriate. Besides which, it’s one of those places where the feeling you get from being there sinks in slowly. Every photo you see adds to the sick feeling you get at realising these people were put through this situation, adds weight to the question of why it happened at all. Very much an eye-opener, and I’m glad I went. Hopefully it’s memorials like these that will ensure future generations are firmly anti-war. The hotel owner had mentioned that a trip down the Mekong would be worthwhile, but she couldn’t advise me on which company or tour to go with. Instead she said I should find one but that she would assist in making the booking. I did some research and found an expensive but very highly praised operator, and took my laptop down to show her exactly what it was I wanted, and the number she could call. It was after business hours and getting on in to the evening, and I asked if she thought we may have left it too late, but she said that tour operators usually open late on business days. Still, I asked if she could let me know when it was booked. I didn’t hear from her, so I went down later to ask her if everything was sorted, and she assured me it was and that we should be in the lobby to take a 7:45am taxi. That was a bit strange, since the tour’s timetable said they left at 7:30am, but I figured maybe that’s when they started doing the rounds of the hotels and picking people up to take to the docks. In the morning we were given a piece of paper with an address on it, and had to pay a taxi to take us there. It was some random travel agency, which had extremely cheap Mekong tours. Not what we’d signed up for. It was also the second time someone had pointed out what we wanted was really expensive, and theirs was really cheap – as if cheaper was better. Basically the opposite of what we normally expect. Extremely disappointed, we took a taxi back to the hotel where the owner was very apologetic for the misunderstanding. I still don’t quite know what happened – whether she’d tried to book the tour we wanted but couldn’t, or just saw the photos of the Mekong River and found an operator who would take tours… but then why ask us to source our own? She did at least agree to take the amount we’d paid for taxis off our final hotel bill, which was a nice gesture. Lesson learned though – sometimes it’s just better to book yourself. Instead we spent the day working on HCTP, then down at a nearby mall in the air-con for lunch and a movie (Oz The Great And Powerful – a bit over the top and melodramatic, but still entertaining). It has been somewhat confusing just knowing what to call this place. On the map it is ‘Ho Chi Minh City’ but everyone calls it Saigon. I can’t remember who we spoke to but apparently the centre of the city is still officially called Saigon so we’re just going to call it that since the locals do too. HCMC is too long and hard to pronounce, according to the manager of our hotel. We got off the train from Da Nang at 5am and caught a taxi to our hotel. Fortunately they were happy to let us in and give us a room for an extra half day so we could unpack and have a rest. We slept for a few hours and then caught a taxi to the river and planned to walk back via some site of interest. Saigon is clearly a much wealthier city than Hanoi. There are top-end boutiques, huge gilt hotels and million-dong ($50) buffets advertised. In our walk we found a Myer-like department store where we saw our first proper supermarket in nearly a month. I love looking through supermarkets in other countries. We bought a small sharp knife with a plastic cover to use for making sandwiches and cutting fruit then wandered around the mall. We stopped for a food at a Highland Coffee shop which seem to be modeled on Starbucks. For the equivalent of $10 we had 2 baguettes and 2 iced shakes, which was probably extortionate for Vietnam but we chose it for the view over a busy intersection, hoping for a repeat of the Hanoi City View, where watching the streets was like some unending episode of Funniest Home Video traffic edition. Sadly that part of Saigon was quite tame and there was no crazy driving to watch apart from the odd person on a scooter texting on their mobile. We meandered around in the 38 degree heat and stopped at one of the roadside cafes. I put some ice from my drink in my damp cotton scarf and ran it around my neck. It’s hard to convey in words just how unpleasant the heat here is, particularly combined with levels of pollution that are visible when you blow your nose. Urk. We decided our last stop would be the War Remnants Museum. Mostly photos, it told stories from both sides of the Vietnam War. I was very conscious, walking around, that I knew very little about the war, my studies at school focused pretty much entirely on ancient history. The depiction of the war crimes perpetrated by both sides was horrific and so this morning I’ve been reading up on the causes of the war. It certainly is complicated. Some of the worst things were the pictures of people affected by Agent Orange and the devastation it caused. I can’t comprehend how a country goes through something like that and seems able to forgive and move on. From there we headed back to the hotel. Or tried to. We got lost and our paper map and Luke’s phone couldn’t help us so we ended up jumping in a taxi when we reached the end of our combined tethers. We bought sushi, salad and sandwiches from the local mini mart for a quiet dinner on the deserted rooftop terrace and decided on a tour for the following day. Luke had found an expensive but highly recommended tour on Trip Advisor that used a speedboat to take a small party up the Mekong and avoided using buses. Sounded ideal so we asked our hotel manager to book it. There was some kind of confusion the next morning. We thought (as advertised) that the tour would pick us up but then the hotel called us a taxi and gave us an address so we jumped in and ended up at a travel agent who had us booked on a different, much cheaper ($14) tour. We weren’t getting on another stinkin’ bus so we asked her to call the tour we’d asked for but they’d already left for the day. Le sigh. We caught a taxi back and talked to the manager who apologised for the confusion. Apparently when Luke had shown her pictures of the tour on his laptop she had not realised we wanted that exact tour and thought we just wanted to get to the Mekong. She agreed to take all the taxi fees off our booking and tried to see if we could fit on the next day’s tour but we’re flying out mid afternoon so it wasn’t going to work. So today we have the day to ourselves. Might see a movie then go on an evening river cruise. Quite disappointed as the tour we’d wanted looked pretty great. These things happen though, I guess. No photos – for once I’m glad I didn’t take the camera out yesterday. It was just too hot to be carrying anything. Farewell Hoi An, Hello Saigon. Our last full day in Hoi An was a busy one. 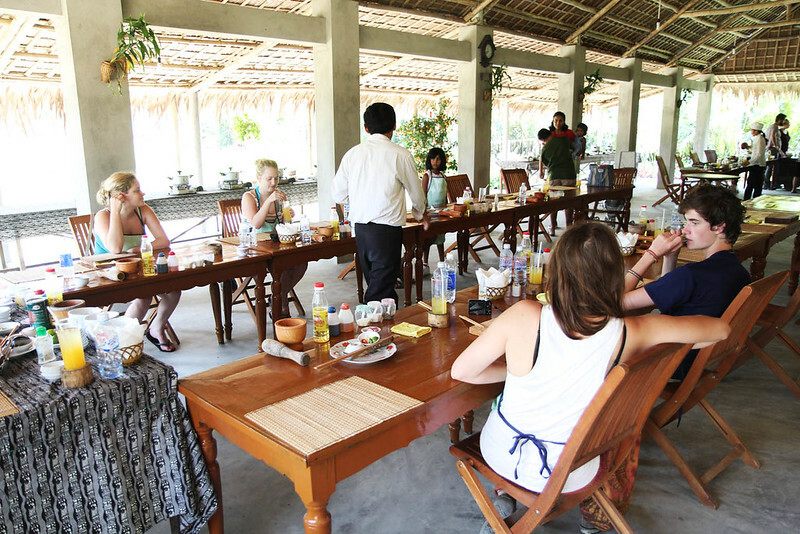 I spent the morning doing a cooking course by myself, that is, without Luke but with about 10 other people – 4 English backpackers and an Indian/Malay family with a couple of little girls. 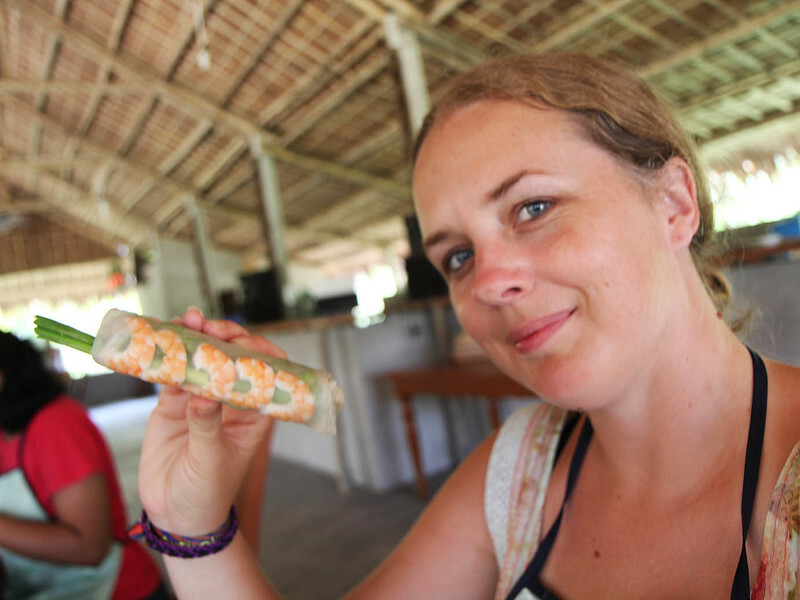 I was picked up from our hotel by taxi and then joined the rest of the group at the local Hoi An markets for a tour and to buy the food we would cook in our class. The markets were colourful and interesting but our translator and guide was a fairly young girl who hadn’t been doing the job long and could not even tell me how much a bread roll cost. She said she’d never bought one, which I found rather surprising. She had to ask the man who was with us, who was doing all the actual buying but didn’t speak English. Turns out they should cost about 3,000 dong (about 15c AUD). Interesting, considering we’d been paying between 10 and 20,000 per roll in Hanoi. It’s hard not to get the feeling that you can’t trust anyone when you’re being charged more than 3 times the proper price. The next day Luke and I tried a new strategy – walk up with the amount you’re willing to pay in your hand and ask for the amount you want and the sight of cash seems to work much better than asking ‘how much?’ and getting told an astronomical figure. It just takes a while to work out what is an appropriate amount to offer. Anyhoo, from the market we boarded a boat that seemed to be furnished with bolted-down dining chairs and headed down the river for 45 minutes. There was a reasonable amount to see but it would’ve been nice to have some information about the industry we were passing and the history of the area. Our guide mainly played with her phone. We got out of our boat amid a plantation of water coconuts and got into two smaller canoes and were paddled a bit further between the palms, getting a closer look at the trees and the grungy slicks of god-knows-what on the surface of the river. It was nice and peaceful though and I spotted some fish in the water. Fish in Vietnam must be the aquatic equivalents of cockroaches considering the filth they survive in. Our next stop was a hut where we tried our hands at milling, threshing and grinding rice to produce rice milk by traditional methods. I found that pretty interesting – a lot of very hard work! We collected the rice milk to use in one of the dishes we were going to make. Last stop was behind the hut and through some vegetable gardens. A large open air structure thatched with palm leaves but, thankfully, containing some powerful fans. It was stinking hot weather. Not so bad on the river but where we were was stifling. I’d brought my fan and got some envious looks when I pulled it out. If you’re traveling to Asia (or anywhere, I guess) in Summer I highly recommend having one on you at all times. They makes a huge difference. The emphasis here was on presentation. The crepe mix was primarily rice milk and coconut cream. It was very much like a taco shell that we filled with delicious, crunchy salad greens. Would love to make this when I get home. We made a beef stock and then added spices and poured it over the cold noodles. Delicious! 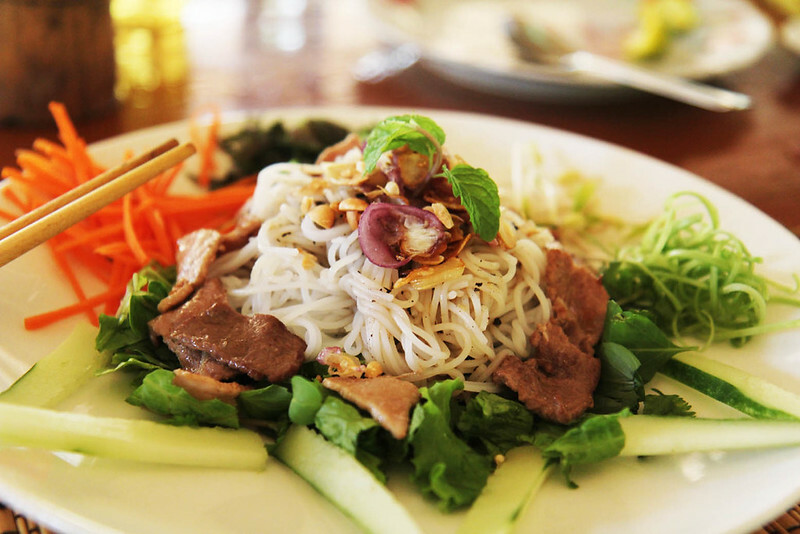 A staple of the Vietnamese diet and particularly tasty when you cook it yourself. So easy! We watched a chef prepare each dish then had our own station to go back to for practice. We got to eat everything straight away (yay!) and there were lots of breaks to chat and drink the endless refills of passionfruit juice. We headed home in a taxi (much faster) and I really enjoyed the whole experience. It could only have been improved with more information and better English on behalf of our guide but she was extremely friendly and positive so that makes up for a lot. On my return to Hoi An I dashed to AoBaBa for one of my many fittings and then to Yali for my coat. I got dirty looks at Yali for being many hours later than they asked but there was nothing I could do. To cut a long story short, my coat was finished that evening and looked fantastic. Possibly a tiny bit tight (if worn with several layers) but that’s more motivation to lose the weight I’ve put on this year. The gob-smackingly superb building that houses AoBaBa. It’s very old (over 500 years) but maintained beautifully and shows what a strong influence Chinese and Japanese culture had on the town, which was once the greatest trading port in eastern Asia. This is one of two courtyards in the building. I had my last fitting at AoBaBa the next morning and was extremely pleased with the results. I’d taken a steampunk-ish styled pattern to them and I think they really enjoyed making it. Certainly Kathy (my fitter and sales assistant) was visibly excited about me trying on the finished product and took a photo and called all the other girls over to have a look when it was done, telling me that she had never made anything like it before. That was nice! 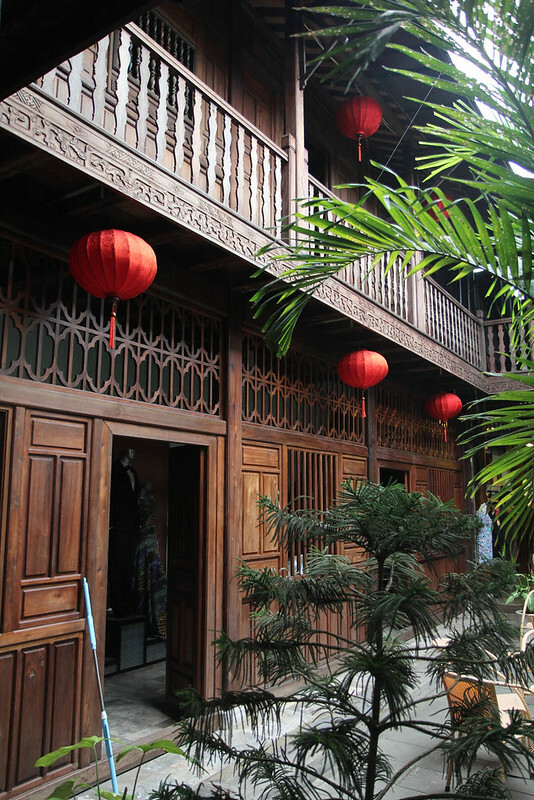 If you’re reading this and thinking of heading to Hoi An to get clothes made do go to AoBaBa and ask for Kathy. The assistant who helped me at Yali was good but I don’t think she cracked a smile the whole time we were there. Be aware that if you go and get clothes made whoever you speak to first will probably end up working very closely with you, so wander around the store until you see someone you like the look of then go up them and ask for their help. Working with a happy person makes the process so much more enjoyable! Kathy and I. Watching her trying to reach my shoulders to pin things together made me feel like a giant. All the Vietnamese women are incredibly dainty and elegant, especially in their traditional ao dai. 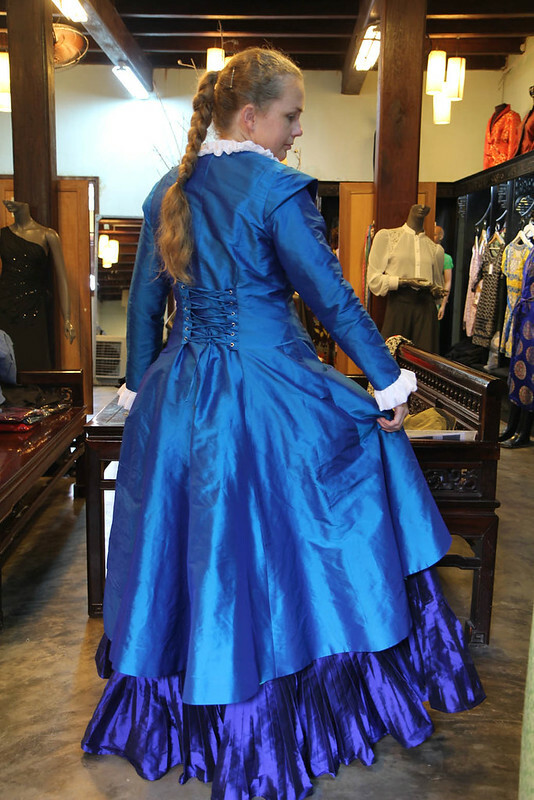 This costume comes in 3 parts, the blue coat, purple skirt and a black and white bustier. Now to figure out where to wear it! We spent our last evening taking photos, eating at Cargo again and visiting the ‘Good and Cheap Bar’ in the hope of grabbing Phi, the owner, for an interview. Sadly we only spotted him once and the vibe was nowhere near as good as the previous visit so we had a couple of drinks then went back to the hotel. 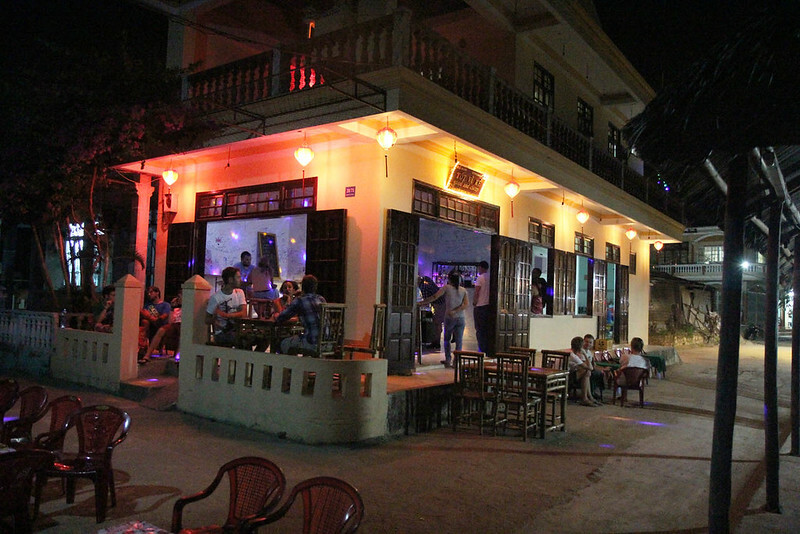 The exterior of the ‘Good and Cheap Bar’. The morning after (yesterday morning, in fact, although it feels like a week ago) we had our final fittings, collected our coats, left our 12kgs of clothing and excess belongings to be mailed home by Kathy (for the bargain price of $70 dollars!!! It’ll take 3 months to get home but still…. $70!) and bought some supplies for the train. We checked out of our hotel and taxi’d to Da Nang ($19 if you’re curious, get your hotel to book a driver, a taxi is about $25) where we had a bit of lunch then boarded the train. This time we had top bunks, which I didn’t think was so bad. We read, ate chip and cheese rolls out of our laps and watched the countryside roll past. We shared the cabin with a couple who had a little boy who was quite adorable and didn’t cry too much, thankfully. In my usual dyslexic style, I’d read the train ticket and thought we got off at 5pm the next day. No, no. Turns out we got off at 5am. So we awoke to shouting and pointing and quickly got our gear together and jumped out into the hot and sticky Saigon dawn. Footage of the train will be in the next video. I neglected to take any photos. Oops!